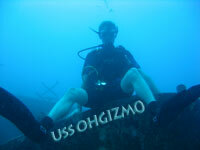 Patent Watch: Underwater GPS, Cell Fitting, Molten Torpedoes | OhGizmo! By Evan Ackerman on 03/13/07 • Leave a comment! As a scuba diver, I can’t help but get excited about this (if it ever gets publicly implemented). Since GPS satellite signals can’t go through water, the patent proposes anchoring buoys at fixed locations on the sea floor or at depth. The buoys will broadcast their GPS positions through sonar in much the same way that GPS satellites broadcast time stamps and position data, and the underwater GPS receivers will work analogously, which should be much more reliable and accurate than current methods. Finally, I can aquatag all my fishy photos. I hate shopping for clothes. Sony Ericsson feels my pain, and is trying to streamline the whole apparel experience with cell phones. Enter your height, weight, age, and measurements into your phone, and then browse for clothing with a special coded tag. Punch in the code, and your phone will send instructions to a screen in the store, which will display a picture of you wearing the clothes. You should still probably try the actual items on, but at least you’ll be able to tell if something makes your hips look big. This weapon idea sounds pretty nasty… It’s basically an underwater, rocket powered flak shell. 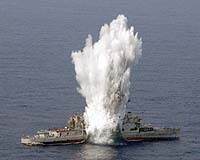 The torpedo uses heat from it’s rocket motor to melt chunks of aluminum in place of an actual warhead, so that when the torpedo hits, it creates a huge shockwave of vaporized water and molten aluminum shrapnel.